Not only does it sit at the foot of one of the most beautiful lakes in the world, the Lake Louise Mountain Resort is one of the best places in the Rockies for an awesome ski vacation. The Lake Louise Mountain Resort, situated on Mt. 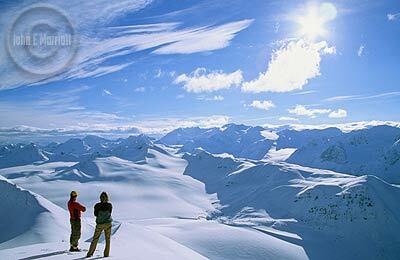 Whitehorn, has a whooping 139 marked ski runs and back bowls, all distributed over four mountain faces. The routes are well divided among beginner, intermediate and advanced trails, so it’s a resort with terrain for just anyone. Lake Louise and the Candian Rockies offer awesome skiing. The nearby Telus terrain park is also designed to be accessible to users of all skill levels as well. And fear not, snowboarders: All of it, including the terrain park, is open to you, too. Some vital statistics: The base elevation of the resort is 5,400 feet (1,646 meters) and the summit tops out at 8,540 feet (2,637 meters). The season runs from early November to late April. There are nine lifts to get you to the slopes: 2 surface lifts, 1 T-bar, 1 triple chair, 3 high-speed quads, 1 six-pack and the gondola. Four full-service day lodges are open in winter for skiers’ convenience. There is, of course, much more to ski than just the slopes at the Lake Louise Mountain Resort. You can also go skiing across country on long trails. And you can take heli-skiing trips up to otherwise unreachable areas. Tired of skiing? It may be hard to admit, but it happens. Sometimes you just got to break things up a little to get the most enjoyment out of a Rockies vacation. Luckily, many other activities await you. Bring your skates, for example, for some fine ice skating. Or you can hire a team for an excursion and become a musher for a day – trust us, there’s no more unique a way to see Lake Louise than on a dog sled! Be sure not to miss the Lake Louise gondola. It runs year-round and provides exquisite views of the glaciers, wildflowers and natural springs in the area. It’s also a good place to look for wildlife, including, if you’re very lucky, a grizzly bear. It’s a much better place to see one of these magnificent creatures than on the hiking trail in front of you! Lake Louise if the facts haven’t added up for you yet, is a great place for Canadian Rockies ski vacations, and should definitely be high on your to-do ski resort list.